That spring, Haysom’s parents had been grotesquely stabbed and slashed to death at their home in the woods around Lynchburg, Virginia. The two lovers’ flight had come amid efforts by investigators to question and fingerprint Soering. The following spring, they were apprehended in London while running an elaborate check-fraud scheme. In British custody, Soering confessed to the murders. By the time that he and Haysom were returned to the United States, though, their relationship was over, and his story changed. Haysom was sentenced as an accessory before the fact, and, in June, 1990, Soering—having recanted his confession, saying that Haysom was the true killer and that he had been trying to protect her—was found guilty of the murders. Both are still in prison. A German-American documentary look at the case, “Killing for Love,” comes to New York and Los Angeles today, and will screen in other cities and towns over the next weeks. In my magazine story, I quoted Karin Steinberger, a Süddeutsche Zeitung journalist, and Marcus Vetter, a filmmaker, who were then collaborating on the documentary “Killing for Love.” It’s a marvellous narration of the case, combining current-day interviews with some footage, photos, and documents from the eighties and from Soering’s 1990 trial. Smartly structured and crisply paced, it manages to elaborate on many of the case’s peculiarities while following some of the twists and new investigative paths that thirty years of scrutiny have brought. The documentary, called “The Promise” during a festival run, is a plea, but not a polemic, for reassessment of Soering’s incarceration. It is also a narrative with a different outline from my New Yorker piece, in part because the filmmakers did not get Elizabeth Haysom to speak on camera from prison. (Not for want of trying: there were, among other things, logistical complications.) The launch point and landing platform for their story, as with most stories today, is thus Soering; the solar system through which they guide viewers is his. After Haysom and some people from her orbit decided to speak to me, I found myself with a different reportorial mandate. The effort to bring the two systems together for the first time since the trials—to cross-check accounts and see where they deviated and converged—was a strange and turbulent undertaking. Soering and Haysom disagreed, with confidence and conviction, about even small, essentially random details that had no bearing on the murders. Each accused the other, not always without reason, of trying to commandeer and guide the public’s approach to the case. In time, I came to think this narrative enmity was as much a part of the story as the larger question of who had taken the victims’ lives. As a late arrival to their shared history—and, more still, as a writer—that haunted me, too. Certain things, however, were clear. As I put it in the piece at the time, “The crimes of which Haysom and Soering were convicted, it has become increasingly probable, weren’t the murders that occurred.” The convicting theory of the case didn’t account for the evidence, and an additional trickle of detail since then has carried it further afield. Last year, Soering’s lawyer commissioned a closer look at DNA tests conducted in 2009. (DNA testing was not widely available in 1985, when the murder was committed.) Much of the prosecution’s physical case had rested on some spots of Type O blood found at the scene of the crime, because Soering had O blood as well. But three DNA experts taken on by Soering’s team used two samples cited in the DNA report to determine that the O-blood sample was male and yet a non-match for Soering’s DNA. This year, to help the pardon petition, Rosenfield has been enlisting law-enforcement voices for support. During my magazine reporting, when I spoke with Chuck Reid, a detective who began (but did not finish) work on the Haysom case, he expressed ambivalence about the convictions. This autumn, he wrote to the governor from a stronger position, saying that he believed Soering to be innocent. Earlier in the year, a Virginia county sheriff, Chip Harding, had also delivered an analysis with the same conclusion. (It should be noted that both men became involved through the initiative and the coöperation of Soering’s associates, who maintain an impressive catalogue of documents and living sources and helpfully mete them out to anyone on the scent. Soering, who likes to anticipate everything, tended to grow distraught when my reporting carried me into less known territory. Both of the letters by Reid and Rosenfeld draw on Soering’s approved library of information, and hew to its broad contours.) From Harding’s reading of the data, especially an unattributed spot of Type AB blood indicated as male, he offered his own theory: that two unknown men were present at the time of the murders, along with Haysom. 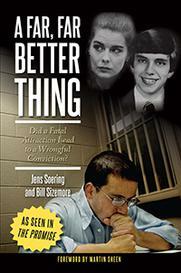 “In my opinion, Jens Soering would not be convicted if the case were tried today,” Harding wrote. It is less clear when such optimism might hope to be rewarded. McAuliffe, in a gubernatorial exit interview this week, which explored his Presidential prospects (“I never take anything off the table”), noted that he was punting the Soering-pardon matter to his successor, Governor-elect Ralph Northam, who takes office on January 13th. 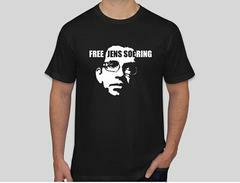 Yesterday morning, Soering phoned me, from prison, full of resentment for the news. I asked him about his reaction to the Steinberger and Vetter documentary. He saw it once, a year and a half ago, and said that what he’d noticed most was himself. “I guess my overwhelming reaction was just embarrassment—for what an idiot I was back then,” Soering told me.